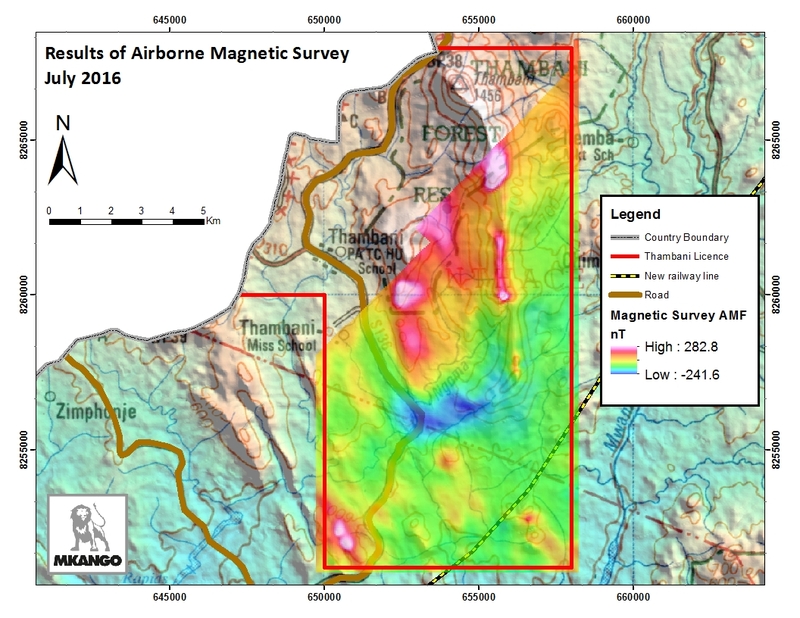 Calgary, Alberta: July 12, 2016 -- Mkango Resources Ltd. (TSXV: MKA, AIM: MKA) (the "Corporation" or "Mkango"), is pleased to announce results of the airborne geophysical survey (the "Survey") covering approximately two thirds of its Thambani licence. The Survey was part of a US$25 million World Bank funded nationwide airborne geophysical programme flown at 250 metre spacing. The Thambani Massif is mainly composed of nepheline-bearing syenite gneiss forming two prominent ridges known as the Thambani East Ridge and West Ridge. The Survey confirms the presence of a previously-identified uranium radiometric anomaly measuring at least 3 kilometres ("km") by 1.5 km, along the western flank of the Thambani East ridge. The Little Ngona prospect, which previously yielded very encouraging uranium, niobium and tantalum values from geochemical sampling, is located at the northern end of this anomaly. A further discrete uranium anomaly, orientated approximately east-west, is located to the south of this anomaly and has yet to be investigated in detail. The Chikoleka prospect in the north-west of the licence area, which also yielded very encouraging results from previous geochemical sampling, was not covered by the Survey. The first set of assay results of 142 soil and rock chip samples from Little Ngona and Chikoleka previously returned variably anomalous U, Nb and Ta values ranging up to 4.70 % U3O8, 3.25 % Nb2O5 in soil and up to 0.42 % U3O8, 0.78 % Nb2O5 and 972 ppm Ta2O5 in rock chips. The Survey also highlighted a number of magnetic anomalies not previously identified, including a 2.3 km linear magnetic high anomaly along the Thambani East Ridge, a further 1 km by 0.5 km magnetic high anomaly located to the north along the Thambani East Ridge, a magnetic low anomaly approximately co-incident with the abovementioned east--west orientated uranium anomaly, and anomalies in a number of other locations. These areas require further investigation to determine the significance of the magnetic anomalies, and whether they are related to mineralisation or geological features. The magnetic high anomalies provide an excellent focus for future exploration for niobium - tantalum, because columbite, a niobium - tantalum mineral, has previously been shown to be closely associated with magnetite and/or ilmenite at Thambani. 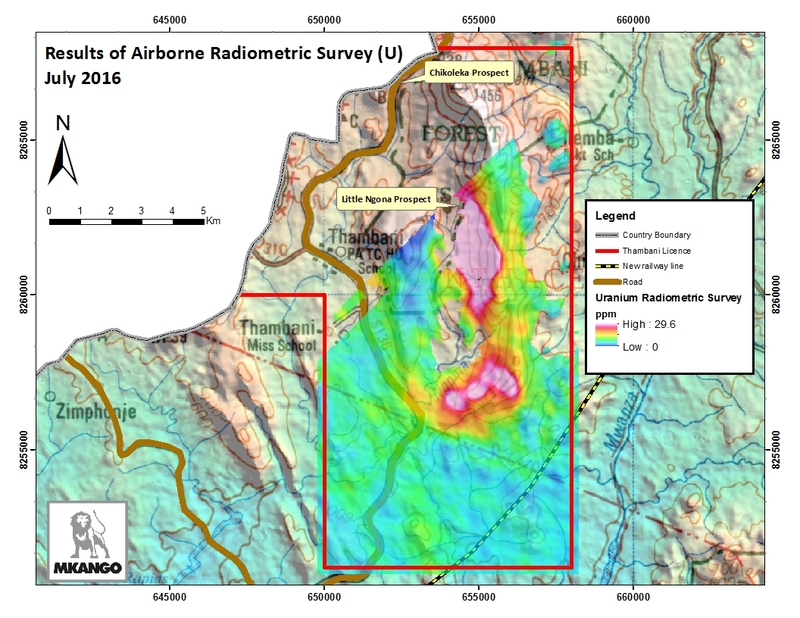 "We are very excited with the results of the airborne survey, which further confirms significant potential for uranium, niobium, tantalum and other minerals in the Thambani licence. This area benefits from good infrastructure, including roads, power and a new railway line passing through the south of the licence area. To date, the market has yet to recognize Thambani's potential and we continue to look at opportunities to maximise value." "Review of airborne data covering Mkango's other exploration licence in Malawi, the Phalombe licence, is underway and we will be updating the market on the results in due course." Mkango's primary business is the exploration for rare earth elements and associated minerals in the Republic of Malawi, a country whose hospitable people have earned it a reputation as "the warm heart of Africa". Mkango holds, through its wholly owned subsidiary Lancaster Exploration Limited, a 100% interest in two exclusive prospecting licenses in southern Malawi, the Thambani licence, discussed above, and the Phalombe licence. The company's strategy is to develop new sustainable sources of rare earth elements and other minerals geared to growth in the low carbon "green" economy, technology and the Fourth Industrial Revolution.